Back in 2009, Tyson Johnston was part of the group show at E7S called "Eaten by Wolves". His new body of work is intense and his bold illustrations layered on top of Jackson Pollock's type backgrounds are just a preview of what's to come. Tyson's current body of work incorporates alot more animals and symbolic weapons from different regions of the world. He refers to his passion for old films like Clash of the Titans. This is just one of the classics he enjoys 'til this day since it's something he watched as a kid. "The title of the show really doesn't have anything to do with the actual paintings " Tyson says. "It's just a catchy title because of the movie. However there will be some Greek mythical influences through some just to make it more fun". 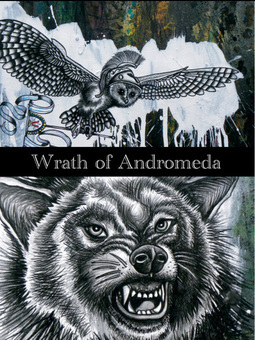 Wrath of Andromeda by Tyson Johnston is on view Wednesday & Fridays noon-6pm and by appointment, May 11–25.